Send a text message to all Hey Warwick mobile app users! 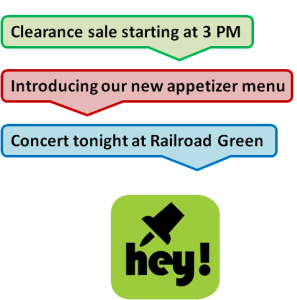 Why wait for potential customers to find out about your new promotion in the newspaper or from Uncle Frank? In the current mobile world, users are best reached via their smart phones. 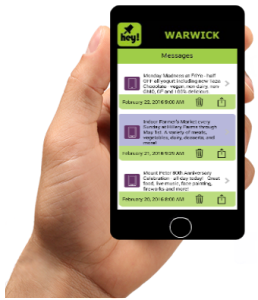 Since Hey Warwick users reside locally and are actively looking for deals and events, you can now contact them immediately, right on their mobile devices. The fastest way to post your message is via the online form below. All orders will be reviewed to confirm that the content is relevant and appropriate. If approved, you will receive an email confirmation and instructions for processing your payment. Thank you for using Hey Warwick!